Web Design Providers: What’s the Best Fit For Your Business? Small Business Website Providers: What's the Perfect Fit For Your Business? We would love to build the perfect website for every type of business, but we can't. Sure, we could try to sell and create websites for every type of business, but we would have too many websites to create to really give each the time and attention needed in order to be a great website. Instead, we focus on a specific range of businesses that need our help, and we know we can serve them well. By concentrating on a specific target market and focusing on the success of these businesses, we're able to help them grow, not just build websites. To help you find the right website provider for your business, we created this short guide. Here are the four types of website providers, and what types of businesses best fit what they provide. Do-it-yourself providers offer easy-to-create templates that businesses can create and manage on their own. Many of these providers have "drag-and-drop" options that allow the site creator (you) to move things around within a template to fit the information and images you want to put in front of your customers. While these types of services offer limited or no customer service or design help and the templates offered for free are limited, this is an inexpensive option and a way to get your first website up and running. Best Fit For: DIY website builders are good fits for new business ideas, a landing page to promote an event, or a portfolio or personal website. This option will require a lot of your time and it will be your responsibility to build, manage, update, and back-up your website, but it's a good first step when building a business or trying to grow your personal brand. Freelancers or solo website providers (meaning the business is a single designer/developer) offer design and development help—taking what you want your site to look like and developing it around your wants and needs. There are many skilled freelancers that make a living designing and developing websites for small businesses and solopreneurs. Skill levels and cost may vary greatly, but this may be a good option for your first real website as your business begins to grow and you're able to live off of the income it provides. The biggest downside we've experienced with freelancers is that many times they eventually decide to join a team, and are no longer available to support your website needs. Best Fit For: New and small companies (1-3 employees), and businesses with $50-250K in annual revenue. This is where Mavidea fits into the web provider puzzle. Agencies are companies with a team of employees, usually from 5-25, that work with small businesses to learn about their business and then create a web presence for that business that fits what their customers want and need. Mavidea involves 5-6 experts in different areas on each website build, including a small business expert, designer, developer, SEO expert, and content writer. Businesses like Mavidea can also offer additional services, including search engine optimization, web hosting, IT services, content creation and more. Best Fit For: Businesses with anywhere from 4-50 employees, over $250K in annual sales, and a growing customer base. Large firms have dozens of employees and take on large designs for national and international brands. Their projects can range anywhere from the high 5-figures ($50,000+) to over $1M depending on the size of the company and complexity of the website. Best Fit For: Companies with 50 or more employees, over $7-10 million in annual revenue. These businesses are usually large, national brands with multiple physical locations, large advertising budgets, and their own marketing teams. While they may create and manage their own website, they often outsource their site to a large firm. 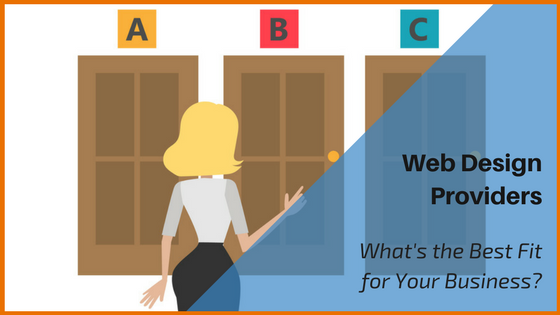 Regardless of what category your business currently fits in for the redesign or first version of your company's website, make sure to carefully weigh your options. Want to discuss your business's next website? Let's talk! Contact us today to get started.